Hello friends,I am happy to announce that I am guest hosting Srivalli's Microwave Easy Cooking(MEC) event.Thank you so much Srivalli for giving me this opportunity. Microwave oven is not only for reheating the food,a variety of delicious food can be cooked.A lot of one pot meal,exotic sweets,scrumptious fries,subzi and a lot more can be cooked in less time.So here comes a challenge to cook in the microwave and request you all to send in your innovative and interesting recipes to make the event success. * The entire cooking needs to be done in Microwave oven. The use of food processor or other gadgets for grinding is allowed,but no stove top. *Please mention clearly the timings used for cooking process and the recipe with final cooking in microwave is not allowed. * Multiple entries are permitted. * Recipes from archives can be accepted ONLY if updated as current post. * Both veg and non-veg recipes are allowed. *Link to Srivalli's MEC event announcement page and this announcement page is mandatory. *Link your recipes to the following linky tool. Looking forward for all your wonderful recipes. Nice to see you nalini after a break. 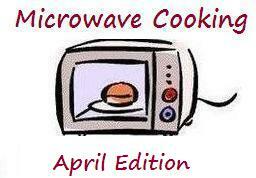 Will try to link few of my microwave recipes. Happy Hosting. Happy hosting Nalini,will send my entries.. Thanks for stopping by my blog.I linked my "Peanut Brittle" to your event. I feel stalwartly about information and love learning more on this. If promising, as you gain expertise,refurbish laptops It is exceptionally helpful for me. would you mind updating your blog with more information. Live Audio Streaming.